Opposition UPND deputy secretary general for politics Patrick Mucheleka says nothing will stop the motion of impeachment from being tabled in Parliament. 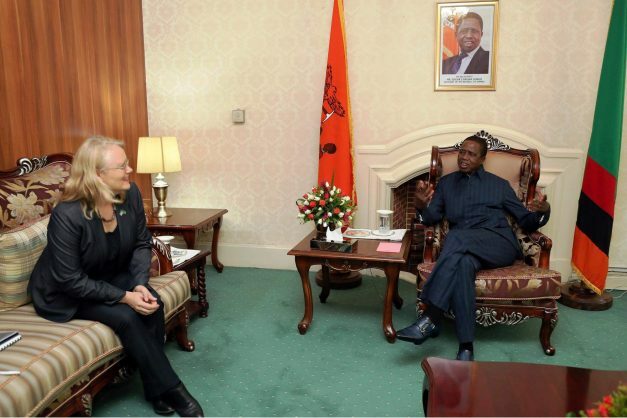 And Mucheleka has called on UN resident coordinator Janet Rogan to extend the same gesture she is giving to the PF in holding frequent meetings with them to his party the UPND as well. Speaking when he featured on a Live Diamond TV’s COSTA programme last evening, Mucheleka said time for Zambians to hear how President Lungu abrogated the constitution is coming. “Zambians should be given an opportunity to hear how Mr Lungu abrogated the constitution. And as UPND, we are very happy that our motion met the constitutional requirements for it to be tabled in the house and nothing will stop the motion from being tabled in Parliament,” said Mucheleka. And when asked as to what motivated the opposition party to put in a motion of impeachment while calling for dialogue with the ruling party, the former Lubansenshi lawmaker said the move was aimed at bringing President Lungu to order for abrogating the constitution. “Mr Lungu has a tendency of breaking the law and that is why we want to bring him to order…no one is above the law. Among the many grounds,we have moved that motion because Mr Lungu abrogated the constitution. The constitution is very clear that when a presidential petition is filed, a sitting President should step aside but that never happened,” he said. Meanwhile Mucheleka has disclosed that there is panic in the ruling party over the impeachment motion. “They are panicking…they were saying they have numbers but the moment our MPs took that motion to Parliament, everyone in PF is issuing a statement. Time is coming; hold your fire. The motion of impeachment must be heard on the floor of the house for Zambians to hear how Mr Lungu abrogated the constitution,” he said. And Mucheleka further said President Lungu and his PF are not interested in the dialogue process. “Mr Lungu and the PF are not interested in this dialogue process and that is why they are now insisting on engaging ZCID to spearhead the dialogue process instead of the Commonwealth who started the process…ZCID has no capacity to spearhead the dialogue and that is very clear in the eyes of all well-meaning Zambians,” he said. He wondered where ZCID was when UPND leader Hakainde Hichilema and other opposition leaders were being arrested. “Our position is very clear; no dialogue will take place with ZCID because it has no capacity to spearhead this dialogue which was initiated by the Commonwealth and the church through Archbishop Mpundu. ZCID has never been relevant; where was ZCID when President HH was arrested and charged with treason? Where was ZCID when opposition leaders like Chishimba Kambwili, Saviour Chishimba and Nevers Mumba were arrested? ZCID was loudly quiet and why this interest now?” wondered Mucheleka. The interview however could not end without the UN resident coordinator Janet Rogan being put on the spotlight. “Where was Janet Rogan when President HH was arrested? Where was she when people were brutally beaten by the police; when people’s rights where being taken away from them? Where was she when the nation needed to heal politically after that 2016 flawed election?” questioned Mucheleka. Good day my brothers and sisters, this is an opportunity for you to be cured from HIV/AIDS as Dr Olumo is helping people getting cured everyday, please also share this information with friends and relatives, who knows you might be saving a family or friends and also love ones who are secretly suffering from the virus, i was positive some time ago but today am cured completely from HIV when i came across a post like this on a news page from a certain man who has been cured by Dr Olumo, without delay i copied Dr Olumo’s number as jotted by the man and contacted Dr Olumo immediately because i was tired of taken the ARVS everyday after some necessary arrangements the medicine was sent to me through DHL express and after completing the dose that was sent to me i went to for test to confirm as Dr Olumo has assured me, behold the results were negative i also went for Elisa test to be sure, behold no trace of HIV was found, isn’t that wonderful? DR OLUMO’S line is +2348138956767 you can add him on whatsapp for a better communication. Immature politicians bark a lot and nothing substantial comes from their mouth.